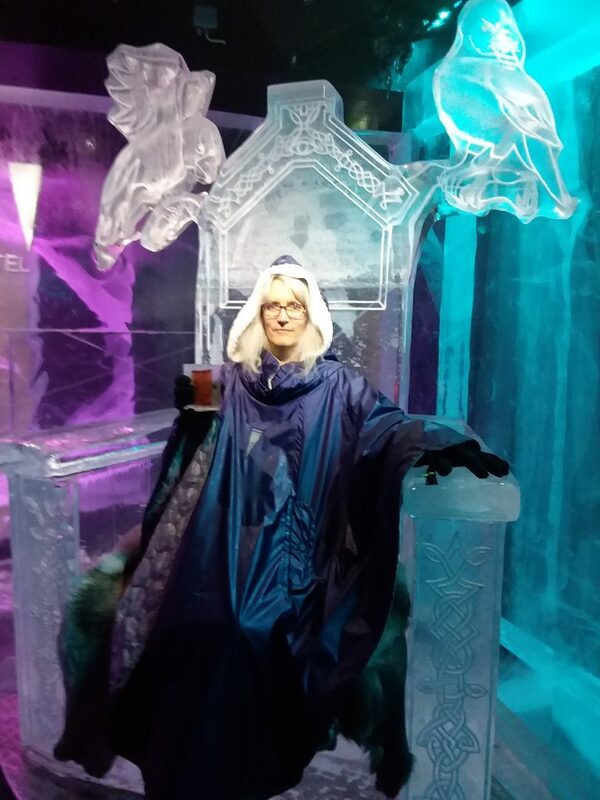 At the Ice Bar in Stockholm with its Viking themed carvings. Skål! 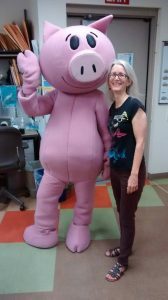 With Piggie from the Elephant and Piggie books. I have the best job! I remember one of the first real stories I ever wrote; you know, one with a beginning, middle, and end. It was called Santa’s Bad Day, and it was about exactly what the title says: Santa was having a terrible day, with one thing after another going wrong. This was where I came in, the narrator of the story. I offered Santa my bike to ride, but on one condition…I got to go with him. He agreed, but as soon as we were on our way, “PSSSSS,” the tire was flat! “This just isn’t my day,” was the last line. The story won some kind of award and ended up in the city newspaper. I thought I’d hit the big time with my name in print! It’s been a long road since then and a lot of years. I went to college, then to graduate school, where I earned an MA in Humanities. Through it all, I kept writing, but the intimidation of the “business” of publishing always keeping me from actually trying to do anything with the stories I wrote. Then the perfect storm happened: indie publishing became a thing, my son grew up, thus giving me more time, and I finally discovered that I wanted to combine my love of history with my love of stories. Organically, out of other projects I worked on, I found I loved reading and writing about Vikings. But that’s not all I write about. I write short stories about whatever strikes my fancy whenever a mood hits me. I have some children’s stories in storage that maybe one day I’ll dust off and look over. Or maybe not. In my day job, I tutor kids in reading. It’s an incredibly rewarding job, and I love it. And when I’m not tutoring or writing, I’ll be practicing Aikido or dancing. I’m also a self-professed Lord of the Rings, Harry Potter, and Star Wars (original trilogy only!) geek. I practically know Star Wars: A New Hope by heart! If you jump over to my Harry Potter Portal page, you’ll see just how much I like to combine my love of books with my love of mythology and history. So, I am many things. I am a mother and a martial artist. A dancer and a writer. A quiet reader and a rowdy old school video game player. A Lord of the Rings geek and a drummer. A lay historian and lover of heavy metal. I hope you enjoy your time in my world. I’m glad you’re here.